Restoration project: Piper L4H "Spotter Plane"
This is of course correct, but only slightly as there were many other ""ingredients", tools and processes that made the Allies finally win the war. One of these other tools were the, at that time in 1944, the unique "Ground to Air" corporation. Or put in simple words, the way Landforces and Airforces worked closely together and basically communicating on the same channel and working on the same task. One way of co-operation could be for the landforces, often being progressing infantry units, to direct air attacks or bombings on enemy positions. The other way of co-operation could also be when a spotter plane was sent over enemy lines or positions giving instructions, positions or co-ordinates to artillery units where to shell enemy positions. One of these famous slow flying aircrafts were the Piper L4H well known during World War Two. Normally only armed with the pilots personal pistol and rather exposed to enemy fire as the light airplane gave the pilot no protection at all. Fortunately there is also a group of entusiasts around the world that put a lot of resources and passion in to rebuilding and maintaining these historical aircrafts. One of our friends in the UK, Richard Cummings, is one of these entusiasts. We would like to bring the story of his restoration project of a Piper L4H that in fact participated in Normandy during D-Day, June 1944 and survived the war. We hope to see the the Piper in the air soon and who knows, we might see the spotter plane in the sky above the beaches of Normandy in 2014 allowing us, the thankfully ground forces, to salute our " little friend in the sky". Richard is assisted by another of our friends, Lee Burrow, the owner of Group North, specialising in tailor made tours, often with a historical or cultural twist. I am rebuilding a Piper L4H serial number 11535 manufactured in December 1943 tail number 43-30244. 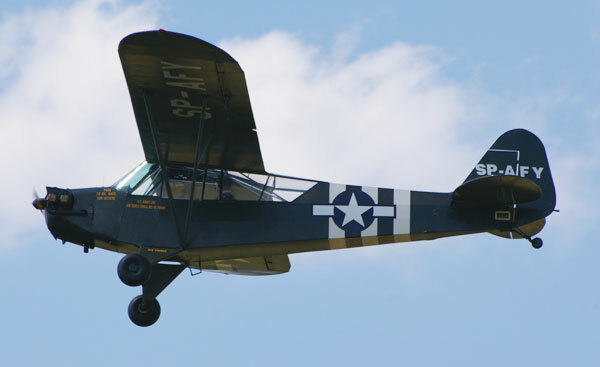 The aircraft served with the79th Infantry Division and was used in the days after D day for the attack on Cherbourg. It then was used until the end of the war. Unfortunately the division did not keep a war diary so which field artillery battery it was with is not known. It has been a ground up rebuild as it had been in a landing incident about 8 years ago. I hope to have it flying soon. We look forward to know more about the restoration process and other updates from Richards project and of course to see Richard and Lee in Normandy in 2014 - surely the place to be, marking the 70th year of the D-Day - June 6th 1944.